The King Garnet Stories by Marianne Parry are not traditional fairy tales, but they have that same feel – kings and queens, a touch of magic, a lesson to learn. King Garnet Stories is a collection of 3 tales about the well-loved and happy King Garnet, as well as his wife Queen Amanda and their friend King Grundle. 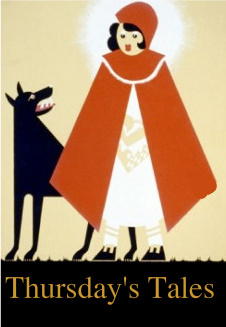 King Garnet loves everyone in his kingdom and everyone in his kingdom loves him, One morning, he awakes to find his legs have grown in the night, so that his feet hang over the bed. At first, he is pleased to show off his new height but, as the days pass, his legs grow so fast that they reach the bedroom door – and even go half way down the grand staircase! Someone is calling a spell on him, but who can it be? King Garnet is so loved that surely no one would want to cause him harm... And more importantly, will his legs every shrink back to normal? Bored of hearing the story of his ever growing legs, Queen Amanda decides to put a stop to his yabbering. She makes a desperate bid to stop him from talking and magically he stops speaking all together! Last, but not least, we follow the story of King Grundle, King Garnet’s oldest and most loyal friend. After a misunderstanding between the two kings, they decide to engage their bored soldiers in a mock battle. The people enjoy it so much that they decide to make it an annual event to unite the two kingdoms. The King Garnet Stories are fun. The first is my favorite. The King’s legs grow way to long and everyone is worried. He is under a spell, but who is casting the spell made it a funny little story. In the second story, King Garnet comes up with a plan to stop his wife from being so bossy. He decides not to talk anymore. He lets his daughters, the doctors, and the witches in on the secret. In the end, the Queen goes back to the nice woman she used to be. It’s a cute story even if the portrayal of the Queen is a little sexist. The last story ends with a light-hearted, almost Renaissance fair type battle. Everyone enjoys the day and the decide to make it an annual event. 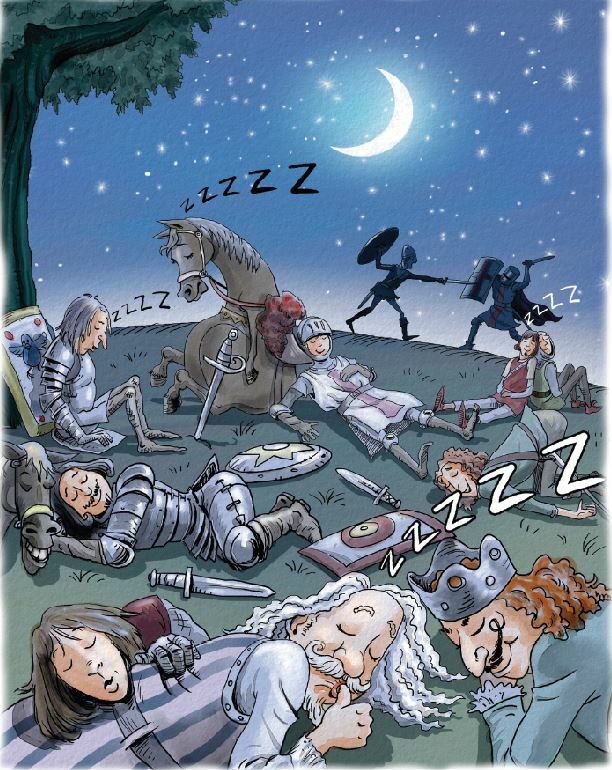 The illustration at the end shows all the soldiers and the two kings asleep on the field, which is pretty amusing. I wish there were more illustrations. The three that we have are funny and really well-done. I guess this is supposed to be an early chapter book for kids to read on their own, but I still think more illustrations would hold kids attention better, and make it a good one to read aloud with younger ones. I don’t know that this is one I would have wanted to add to our personal collection when Amber was little, but I might have borrowed it from the library. Loving the attention to detail on these illustrations. This just looks damn fun.